Now that it’s second semester (how did that happen??) we are in full swing with writers’ workshop! Or is it writer’s workshop? I never can decide if it’s an individual writer’s workshop or a multiple writers’ workshop…I guess it depends if you’re referring to one student or all of them! I like to think of my students individually though, and since that’s kind of the whole point this teaching method, I’m going with writer’s workshop. You teacher types are most likely familiar with what writer’s workshop is, but for you non-teacher-types let me summarize: Writer’s workshop is a teaching method in which class starts with a short mini-lesson. Sometimes this mini-lesson is writing and sometimes it’s grammar. For example, this past week I did verb conjugation charts with my 6th graders and comma rules with my 7th graders. Other times, I’ll do a quick lesson on something like writing a good lead or on making your subjects work (using action verbs instead of being verbs). 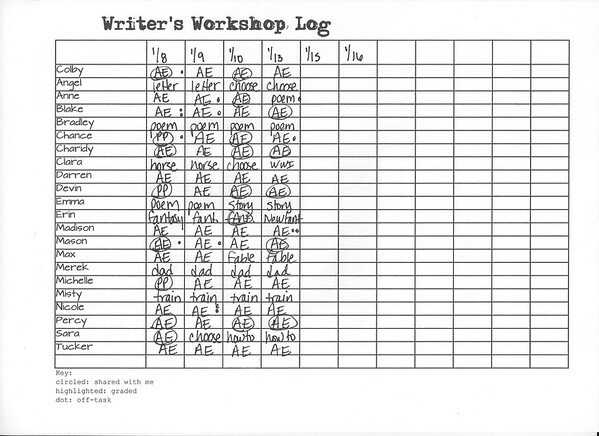 The rest of the class, which is anywhere from 15-30 minutes, depending on the mini lesson, is writer’s workshop time. I try to do writer’s workshop an average of 3 days a week. Every day is too much (no one likes monotony) but less than 3 days a week causes the students to lose their momentum on the pieces they’re working on. Sometimes I will give out little star tickets (our school’s reward system) if students show me that they’ve used that day’s mini-lesson skill in their writing. During the actual writer’s workshop part of class, all of the students are writing but are working on different assignments. It’s kind of like silent reading, in which each student has a book of their choice at their level. 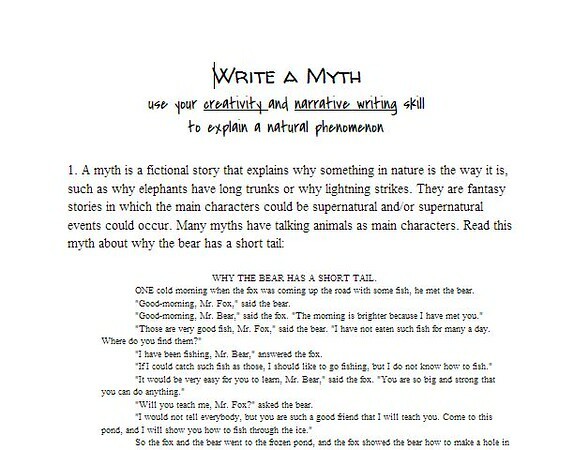 In writer’s workshop, each student chooses their own writing assignment and writes at their level. Just like with silent reading, in writer’s workshop students are guided a bit so they don’t slack off and choose writing assignments that are too easy. 1. Set students loose to grab their laptops, log on, etc. I am blessed to have a laptop lab in my classroom. They are numbered, and each student has one assigned to them. The students also have a writing folder where they keep samples, notes, resources, etc. They keep their writing folders in my room on a shelf, and they pick them up when they enter the room and drop them off when they leave. 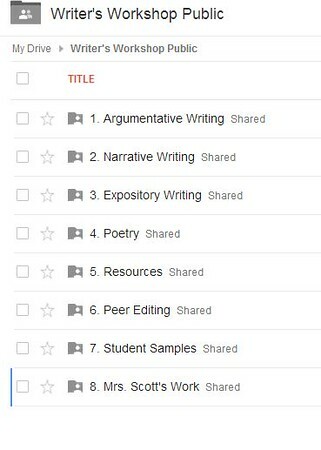 Writing folders’ contents are way too valuable to leave the classroom. Keeping track of what each student is doing every day is ESSENTIAL. I need to know that they’re making progress! In fact, they get a grade (10 points) every day for making progress. This includes staying on task, moving forward on assignments, utilizing work time, etc. My spreadsheet tells me a lot of things. 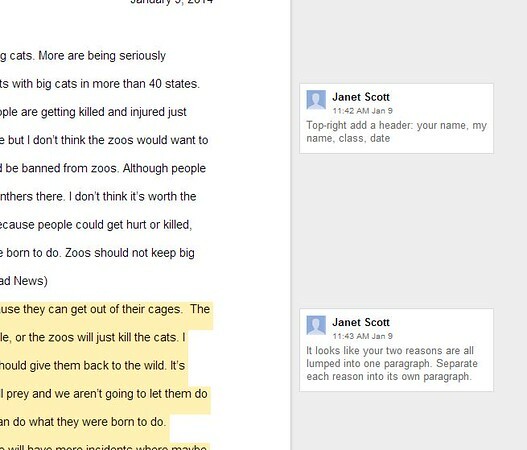 Looking at the one from the class above (which is fictional), I can see that Colby has been working on an argumentative essay for four days. Every quarter, there is a required essay. This quarter, it was the argumentative essay (AE on the chart), which is why so many kids are working on it right now. 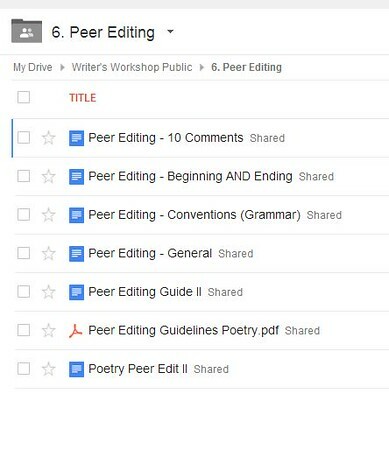 The 8th and 10th are circled because those are the days he shared his essay with me. This means he shared the document with me via Google docs (more on that later). If several days go by and a student hasn’t shared, I ask them to do so. I like to check in at LEAST every 4-5 days. Some students share their work with me daily, and that’s awesome. The little dots mean I caught a student off task. This helps me remember if they deserve a 10/10 at the end of the day when I put in daily points. 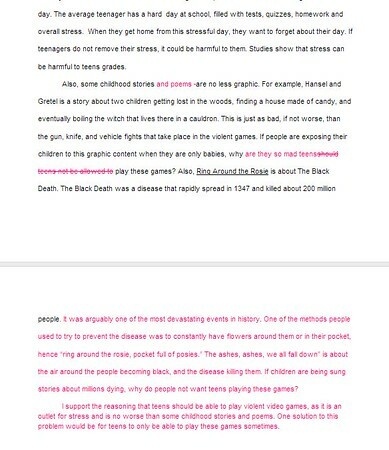 I forgot to highlight on this sample…I highlight the assignment on the date that I graded it. Students cannot move onto a new assignment until I’ve graded the previous one (unless I give special permission). The highlighting reminds me if I’ve graded their last piece of work or not. I have around 150 students. No way can I remember whose I’ve graded, especially when I’m reading about 50-60 papers a day! The reason they will sometimes try to sneak to the next assignment is I do not let them be “done” until their paper has reached the A level. That’s right, all of my students receive an A on their graded assignments. What the what?? Here’s why: I find more value in having the students revise and revise and revise (even if it’s 100 times) to bring their essay to an A. They share with me, I make suggestions, they fix them, repeat as needed. 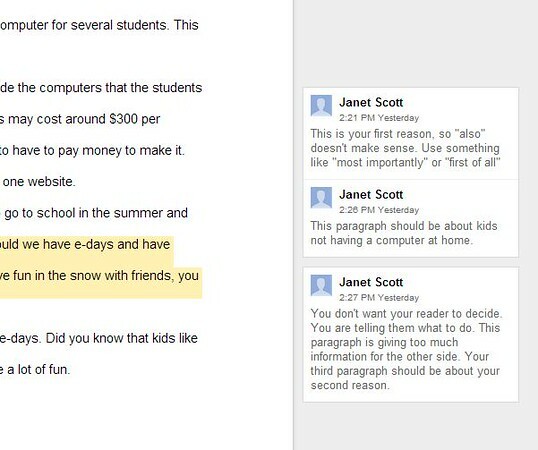 They only have two graded papers per quarter–the assigned essay and one free choice one. I do have a lot of grades in my class; besides 10 points a day for writer’s workshop, and we also have a quiz every Friday and at least one other graded assignment or activity per week. Remember, I only do writer’s workshop about 3 days a week. The papers beyond the two required papers are just for the sake of writing. Just like all books the students read don’t have to be for book reports. I don’t usually get too far behind in commenting on their papers during class. However, the students know that if I am behind, rather than sit and wait, they should start on their next piece. It’s perfectly fine to have two things going at once! Towards the end of class, several of them share with me. 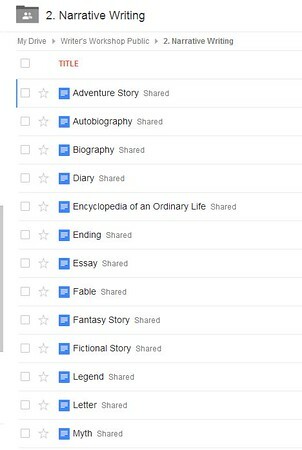 I sort these into folders (I talked about organizing Google docs here). Every night, I go through and read and comment on the essays they’ve sent me. Like I said, I probably read 50-60 a day, at least, but I can whip through them pretty quickly. I probably only actually grade 5-10 a day. The rest of them it’s just a matter of quickly skimming through and making some suggestions. I do NOT critique grammar, but sometimes I will make a comment that their grammar needs help and to have another student help. There is no way I could keep up with the volume of grading I do if I checked grammar! Other teachers who use writer’s workshop actually conference one-on-one in person with their students. Sometimes I will call a student up to my desk and do this, but I always type in the comments, too. You’re crazy if you think you can make 5 suggestions to a paper during this conference and the student will remember (nor will you). Typing in the comments allows me to very quickly make a note, sometimes a long one, on their paper, as I can type waaaaay faster than I can write. It’s there for them to look at when they come back to edit. Some students are now starting to ask me questions using the comment feature, too, which is perfect! The other thing I don’t like about vocal conferences is that it seems to encourage other students to talk. Complete silence leads to more writing, I’m sure of it. They are eavesdroppers, you know. You are talking to another student, and they are listening. Unless you’re talking to THEM, then they may or may not be listening. Haha! 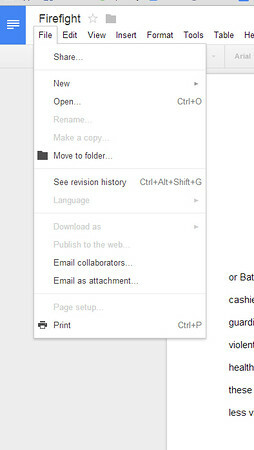 The other super cool amazing thing about Google docs is allows me to see the revision history of the document. This means I can look back at every day we did writer’s workshop and what the student changed that day. I can also see if they worked on it out of class (not a requirement but I commend them for it). That day’s changes show up in red. Isn’t it cool to see exactly what they worked on that day?? I can even see more frequent revisions, like every few minutes, but I rarely use this. I use the revision history when I’m giving “making progress” daily points, too. Now, let me share how my students choose their next assignment. They may write about anything they like. I do have a binder at the back of the room with assignment ideas, but they may do their own thing as long as they check with me first. Next to the binder is a big file-holder bin with copies of each of the assignment page descriptions. There is a binder of student samples, too. 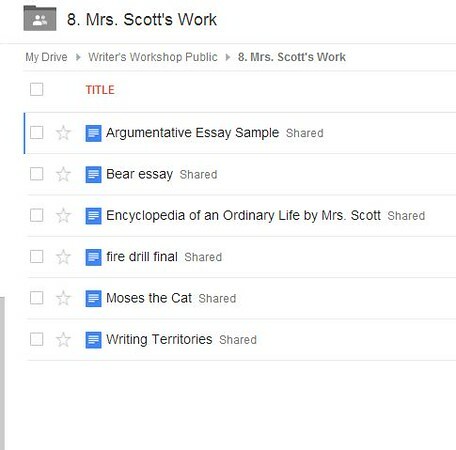 Once they’ve chosen an assignment, they can either make a copy of the Google doc version for themselves or grab a printed one from the bin. And there you go, that’s how I do writer’s workshop. My advanced writers soar because they have so much freedom and they can move so far ahead. I have one sixth grader who finishes an assignment almost every day (he finishes it at home at night). My reluctant writers make great strides because they are revising over and over. They are willing to do this because it’s so easy to revise typed documents. I think everyone benefits! 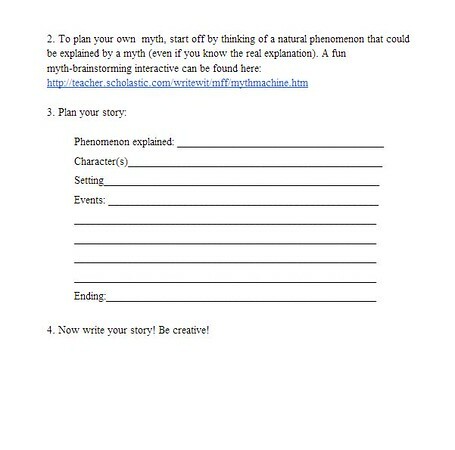 You can get 47 of my writer’s workshop assignment sheets at my Teachers Pay Teachers store: WW Assignment Sheets Listing. 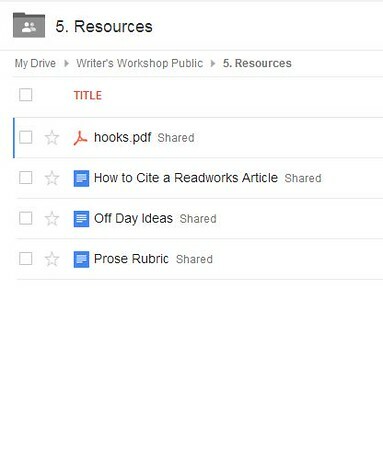 Has anyone else tried writer’s workshop? What do you think? Did you actually make it to the bottom of this post without falling asleep? If so, congrats!! This entry was posted in Chit Chat, Google is Taking Over the World, Teaching Ideas, Tech Nerd by Jan. Bookmark the permalink.